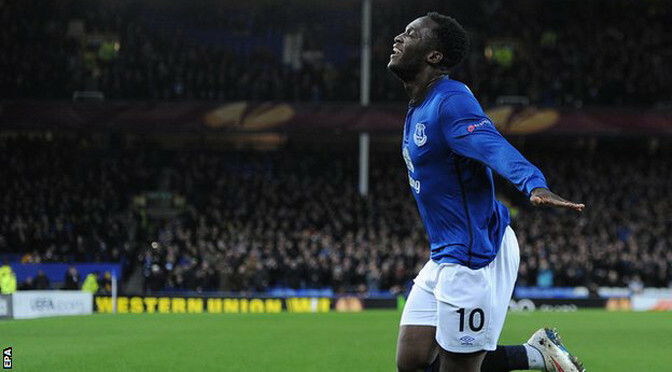 Romelu Lukaku scored two goals to reach a total of five in the tie as Everton cruised past Young Boys to progress to the Europa League last 16. The Belgian striker followed up his hat-trick in the 4-1 win in Switzerland with two more after Sekou Sanogo had given the visitors the lead. 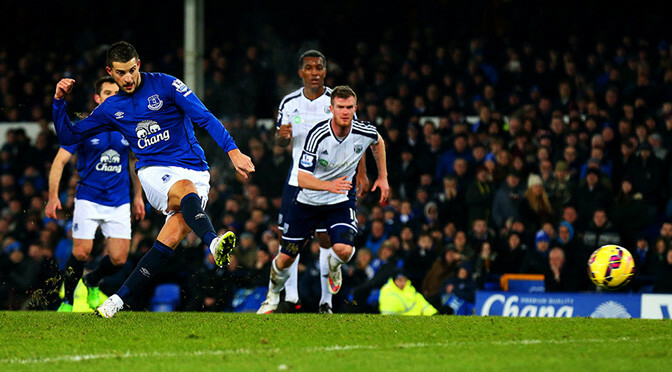 Kevin Mirallas then made it 3-1 before the break as Everton ensured a safe passage into Friday’s last-16 draw. They are now the only British side remaining in the Europa League. The Merseysiders are flying the flag after Liverpool, Tottenham and Celtic all exited the competition on Thursday. A similar fate was never likely to befall Roberto Martinez’s side after their exploits in Bern last week but a slow start to this encounter gave Young Boys a glimmer of hope and left the Goodison Park crowd frustrated. Forward Kevin Mirallas’ missed penalty cost Everton the chance of a first win in eight matches — but what was more galling for home fans was the fact he took it in the first place. Whoever made the decision a minute before half-time needed to take a long hard look at themselves considering spot-kick regular Leighton Baines had previously scored 15 out of 16. Mirallas’ withdrawal at the interval of the goalless draw at home to West Brom merely posed more questions as speculation continues to link the Belgium international, who has 18 months remaining on his contract, with a move away. Manager Roberto Martinez admitted in the wake of the forward’s impressive display in last week’s FA Cup exit at West Ham that the club had to satisfy the Belgian’s ambitions for him to commit to a new contract, but considering his injury record the 27-year-old may have to consider if he still owes the Toffees something. A week is a long time in football and, after leaving the Upton Park pitch to rave reviews, Mirallas left Goodison under something of a cloud. That a missed penalty, and the whys and wherefores of who should have taken the kick, was the main talking point spoke volumes about the quality on show. Everton knew West Brom would be tough to break down under new manager Tony Pulis and so it should have come as no surprise to see the visitors employ a 4-5-1 formation with Saido Berahino, with six goals in three matches, posted wide left to curtail full-back Seamus Coleman’s forward runs. Pulis came for — and left with — a point which extended his unbeaten run since taking over to three matches, although one of those was against non-league Gateshead in the FA Cup. His first task on replacing Alan Irvine was to make the Baggies difficult to beat — something of a trademark for the experienced manager — and he has done that with no goals conceded on his short reign. The draw took them three points clear of the relegation zone and has given them a platform on which to build. Everton are only a point ahead, having taken just two points from a possible 18, and the chorus of boos when Martinez replaced midfielder Muhamed Besic, comfortably their best player, with striker Arouna Kone late on and also at full-time was an indicator of how frustrated the locals are. The football has not been anywhere near what they expect after some brilliant performances last season and, while it has not all been their own fault, they have to turn things around. Martinez has officially complained about a lack of decisions going Everton’s way and referee Mike Oliver’s leniency in allowing James Morrison and particularly Craig Gardner to get away with hard and late challenges on Seamus Coleman and Ross Barkley respectively did not help the manager’s early mood. In truth there was little else for Oliver or indeed anyone else to get too agitated about until the final minute of the half, with Mirallas’ free-kick comfortably held by goalkeeper Ben Foster and Joel Robles saving from Gardner’s offside half-volley. It appeared the mediocrity would be broken in the 44th minute when former Toffee Joleon Lescott handled Romelu Lescott’s chest trap, but Mirallas — so deadly from 20-plus yards but apparently much less so from 12 — hit the foot of a post and the ball spun behind. The half-time video message from Hollywood star Sylvester Stallone, urging the crowd to generate some atmosphere as filming took place for Rocky spin-off movie Creed, was an optimistic one considering what had gone before but, somewhat fittingly, Everton did show a bit more appetite for a fight. It was without Mirallas, however, who did not appear for the second half. Ross Barkley, Lukaku and Besic (twice) all had shots deflected behind but Foster barely had a save to make. 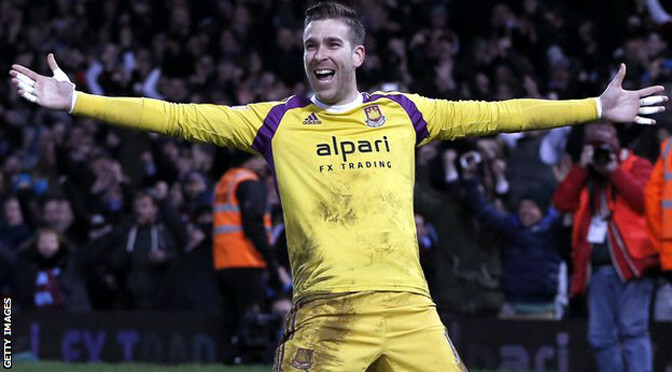 The same was true of his counterpart Robles, but West Brom’s priorities lie elsewhere. Enner Valencia put the hosts ahead when he collected Andy Carroll’s pass and shot past away goalkeeper Joel Robles. Everton had Aiden McGeady sent off for two bookable offences, but equalised with Kevin Mirallas’s free-kick. Romelu Lukaku put the Toffees in front after Mirallas’s fine run, but Carlton Cole’s close-range finish took the game to penalties, where West Ham won 9-8. After it finished 2-2 at the end of extra-time in an amazing match, the third-round replay went to a shootout. Everton’s Steven Naismith had his penalty saved and Stewart Downing had a chance to win it for the hosts, but Robles saved his effort. However, the Spanish goalkeeper then hit the crossbar with his attempt before Adrian threw off his goalkeeping gloves and calmly converted the 20th penalty to set up a fourth-round tie with Bristol City. Newcastle recorded their first league win in four games as they beat out-of-form Everton at St James’ Park. It was the Toffees’ fourth league loss in five matches, although they made the ideal start when Arouna Kone fired in. Papiss Cisse swept home to level from Mike Williamson’s pull-back, before Ayoze Perez drove in from 18 yards. Jack Colback then pounced on Ross Barkley’s mistake to poke home the third before Kevin Mirallas set up a tense finale with a clipped finish. That is now only one league victory in seven for Everton and their third successive defeat. Bar the win over QPR, this month has been one to forget for manager Roberto Martinez. The Spaniard’s second season in charge of the Toffees has so far failed to match the high standards of the first, with the side 16 points worse off than they were at this stage last term. Everton have problems all over the pitch. Only the Hoops have conceded more goals than them, while in attack the goals are not flowing. Striker Romelu Lukaku was a success last season while on loan, but since becoming a £28m permanent signing he has failed to rediscover that form. The Belgian was demoted to the bench in one of seven changes made to the first XI by Martinez, with Kone and Samuel Eto’o starting. And Kone, who was making his full debut for the visitors having missed 18 months with injury, repaid his manager’s faith in him with his first goal for the club after just five minutes. The Ivory Coast striker drifted past his markers to convert from close range from Seamus Coleman’s cross. That was the 12th goal the Magpies had conceded in the last four league outings and at that stage the signs looked worrying for Alan Pardew’s faltering side. But the Newcastle manager has a potent duo up front – Cisse and Perez. It was the Senegal international who pulled the scores level shortly before the break, when he was in the right position to drive in after defender Williamson salvaged a ball that looked like it was going out of the play. Perez – a revelation since his £1.5m move from Tenerife – then put Newcastle into the lead when he wriggled past his markers on the edge of the area before drilling a shot through the legs of Coleman and past keeper Joel Robles. With a spring in their steps, the Magpies added a third when Colback scored his first goal for his boyhood club after Barkley’s attempted clearance from Daryl Janmaat fell at the midfielder’s feet. Mirallas gave the visitors hope when he raced forward before placing his shot past Jak Alnwick, but Newcastle held on. Everton ended a run of four games without a win as Queens Park Rangers endured another miserable away day. Rangers have yet to pick up a single point away from home this season and never looked likely to end that sequence at Goodison Park once Ross Barkley put Everton on the way to a 3-1 victory in the 33rd minute. The midfielder netted his first goal of the season in spectacular fashion and Kevin Mirallas made it two before half-time, with Steven Naismith adding a third eight minutes after the break. Everton sat back and allowed QPR to come at them, but Bobby Zamora’s tap-in 10 minutes from time was too little, too late. It was just a third home win of the season for Everton, who climb above Liverpool into 10th place in the Premier League table. QPR’s cause was not helped by leading scorer Charlie Austin being suspended following his red card against Burnley, while defender Steven Caulker was also out after suffering a head injury at a team lunch last weekend. For Everton, Naismith returned after a hamstring injury and there was the welcome presence of John Stones and Arouna Kone on the bench following their spells on the sidelines. Boss Roberto Martinez also brought Barkley back into the starting line-up and, in an Everton side that looked to have lost confidence, he stood out from the start. In the 12th minute, the 21-year-old played a fine ball over the top for Naismith, and the Scot’s cross was just ahead of Romelu Lukaku. QPR had arguably made the brighter start, with Matt Phillips guiding a tricky volley just over the bar and Junior Hoilett shooting straight at Tim Howard. The home fans let their disgruntlement be known but there were signs of the sort of play Goodison Park has become accustomed to in the 26th minute when Coleman broke down the right and crossed for Naismith, whose shot was inadvertently blocked by Lukaku. And seven minutes later the hosts took the lead through a moment of individual brilliance. Barkley picked up the ball by the half way line and drove forward before unleashing a shot that arrowed into the top corner via a slight deflection off Mauricio Isla. If there was an element of luck about that one, there was a lot more about Everton’s second 10 minutes later. Joey Barton gave away a free kick for catching Naismith with his elbow and Mirallas’ shot spun off the head of Eduardo Vargas and beyond Rob Green. Vargas had enough time to get a deliberate touch but he could not have directed the ball into a worse position as far as his team and keeper were concerned. Everton’s tails were well and truly up and they almost managed a third before half-time but this time Aiden McGeady’s curling effort was just past the far post. The opening moments of the second half saw Mirallas appeal for a penalty after Richard Dunne put his arm across the forward, but any real contact appeared minimal and referee Neil Swarbrick was not convinced. The hosts remained well on top, though, and got their third in the 53rd minute after Green and Dunne had both made a mess of trying to clear the ball. Mirallas played in McGeady on the right and his cross found Naismith in yards of space to head the ball in despite the efforts of Nedum Onuoha and Dunne on the line. QPR boss Harry Redknapp introduced Zamora and, with Everton looking like they thought the job was done, Rangers enjoyed a decent spell. Leroy Fer and Jordon Mutch shot over but they got the goal they deserved in the 80th minute when Howard could only parry Mutch’s shot straight to Zamora, who netted his first of the season. The home fans were becoming frustrated again, and the game had a sour end for Everton when Mirallas was carried off after a poor tackle from Mutch. The Belgian’s ankle appeared to buckle and he was replaced by Kone, making his first league appearance for more than a year. The Ivorian almost set up Samuel Eto’o for a fourth but his shot hit the far post deep into injury time. Everton are through to the Europa League knockout stage as Group H winners after victory at Wolfsburg. 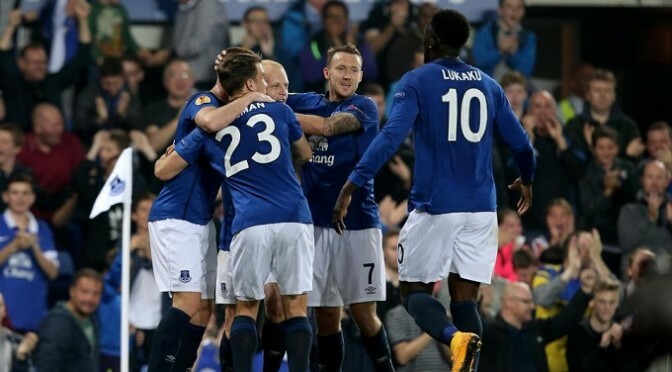 A 1-1 draw in the other group game between Krasnodar and Lille meant the Toffees progressed regardless of the result in Germany. Three points ensured top spot, however, as Romelu Lukaku powered home before half-time after Wolfsburg’s Ivan Perisic had a goal ruled out. Kevin Mirallas sealed victory in the second half with a goal on the break. Everton, four points ahead of Wolfsburg at the top of the group, progress to the last 32 with a game to spare as they look to secure a first European trophy since 1985. Both sets of players went into the game unaware of the scoreline in the group’s other fixture, which kicked off one hour earlier. Each side knew, however, that a win would guarantee qualification and that might have played its part in a frenetic start. Wolfsburg, with eight wins from their last nine games, were immediately on the offensive as Perisic lashed into the side-netting while Aaron Hunt drew a full-stretch save out of Tim Howard. Sylvain Distin hit the bar with a downward header between those chances but Wolfsburg should have been ahead midway through the half, when Perisic was wrongly ruled offside when he stabbed home from close range. It was a let-off for Everton, and a crucial one, as they hit Wolfsburg on the break just before half-time. Distin’s header aside, the visitors had barely threatened in the first 45 minutes but snatched the lead when Lukaku received a pass from Kevin Mirallas, outmuscled two defenders and ran through on goal before finishing calmly. 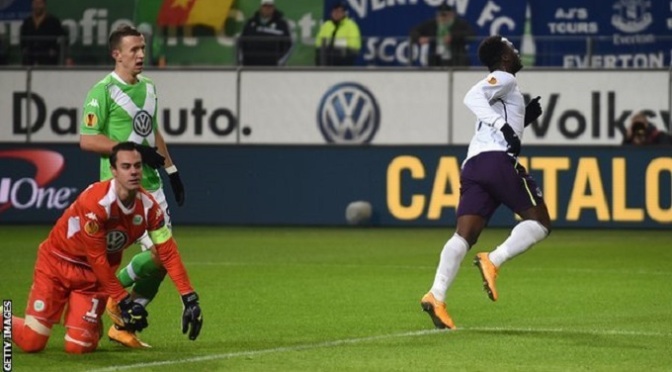 Knowing that defeat would leave them needing at least a draw in their final game against Lille, Wolfsburg again pressured the Everton defence in the second half. The hosts were again denied when former Arsenal striker Nicklas Bendtner had a header ruled out for offside, but also Everton looked dangerous on the break – though Aiden McGeady somehow contrived to sidefoot over when presented with an open goal. However, Everton wrapped up the win with another breakaway goal as Lukaku sent Mirallas away and the forward confidently slotted home.